The definition of “comfort food,” in my opinion, has become diluted. To truly be comfort food, a dish should be so delicious and so filling that even if you’ve had a hard day, it will start to look better after dinner. Lotus Thai Bistro, a restaurant squeezed into the California Avenue shopping district, is one of those scant few eateries that feeds the weary spirit as much as the empty stomach. Like many Thai restaurants, there are a lot of excellent appetizer options. The chicken satay skewers ($7.95) are a little softer than those from other eateries, and combo well with the peanut satay sauce. Vegetarians or those on a budget might want to order the fried spring rolls ($4.95), which are filled with a fresh blend of vegetables. The soups are served in entrée portions, larger than those at many other restaurants. Though you get a lot, the soup has enough variety of flavor and texture that it works as an entire meal, and you can always take it home. Look out for the Thom Kha ($6.95-8.95), which combines the delicate sweetness of coconut with the acidity of lemongrass. My personal protein recommendation for this soup is steamed tofu, which adds a delightful chewiness without overpowering the broth. You can find your favorite Thai curries at Lotus Bistro, which are served with a number of different meat and vegetable options. (The menu on Google does not have several of the fish options I encountered, which may be seasonal.) If you want to pour your curry over something complex like Pad Thai, my suggestion would be the simple but effective yellow curry ($9.95). 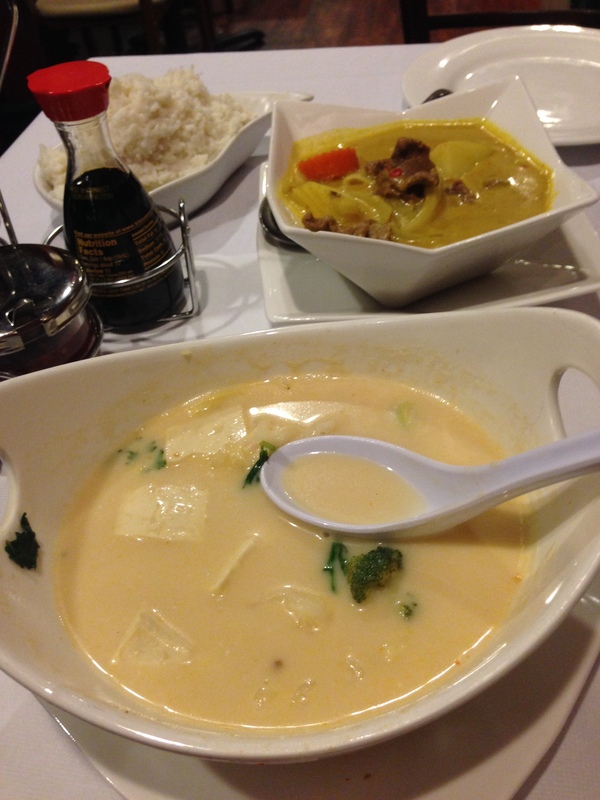 Another excellent choice is the mussaman curry ($12.95), which cuts to the core with just the basic ingredients. All soups and curries are available at four spiciness levels; I personally enjoyed the “medium” level, finding the kick substantial but not overpowering. However, spice is a personal decision. It must be mentioned that the coconut rice ($4.50, not shown on Google menu) is an out-of-this-world treat, a sweet, sticky, addicting dish that’s almost impossible to finish once you start. It’s especially great as a vehicle for curry. Lotus Thai is a great low-key restaurant that serves classic dishes for a range of customers. The large portions are great for sharing, taking home, or enjoying on your own if you’re very hungry. They also deliver (through waiter.com and other sites), so if you’re hosting a party nearby and want to order something other than pizza, give Lotus Thai a chance!